Due to ongoing public interest, photographer Alison Laredo’s exhibition - Ten Weeks That Changed The World - has been extended at the Linenhall Arts Centre in Castlebar until Saturday July 16. 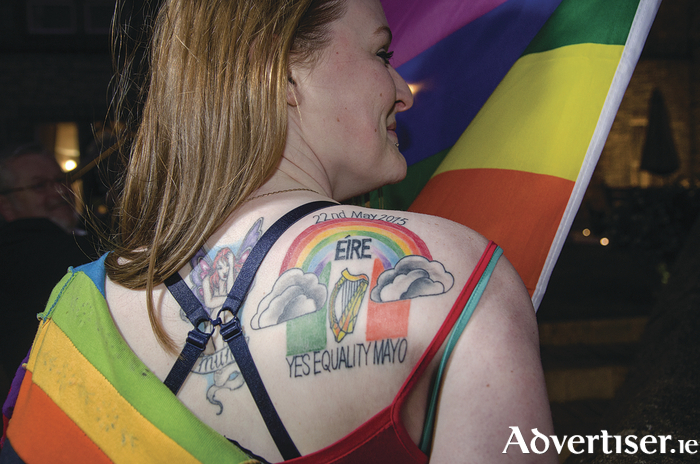 To celebrate the first anniversary of the Marriage Referendum in the early months of 2015, the Castlebar-based photographer captured the magic surrounding the vote as it unfolded. LGBT people and their supporters came together all over rural Ireland to campaign for a 'yes' vote in the Marriage Equality Referendum. Yes Equality Mayo took up the fight here and Laredo was there every step of the way. Her photographs take us to that point where the personal becomes political, where solidarity becomes community, and where that translates into revolution. The Linenhall gallery and foyer are open Monday to Friday from 10am to 5pm and on Saturday from 11am to 5.30pm. Admission to exhibitions is free.